At Leanpub, we’re committed to paying authors really high royalties. Our royalty rate is 90% minus 50 cents per sale, which is, to say the least, very competitive. (The 50 cents is to cover a portion of transaction costs; the rest of the transaction costs are paid from our portion of the sale). 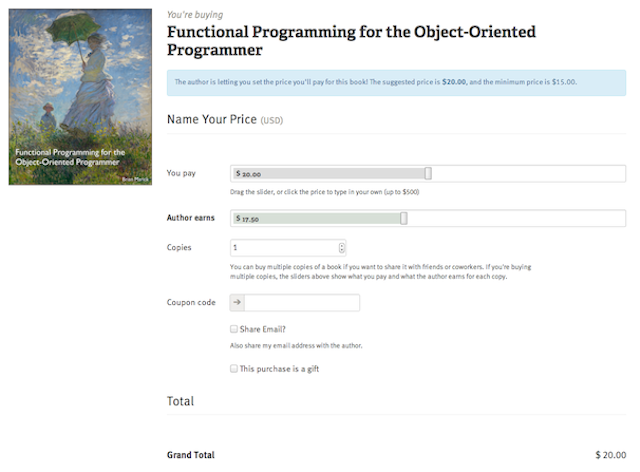 So in this example, if someone were to pay $20.00 for Brian Marick’s book, Brian would receive $17.50. You probably noticed there are two sliders there: one on top for how much you’re going to pay, and one on the bottom for how much the author is going to earn. One thing we’ve found is that customers often use the bottom slider to set the price, which means they’re more interested in figuring out how much they want the author to get, than they are in the overall price they’ll be paying. This, of course, only works because our royalty rates are so high that customers can basically ignore the difference between what they’re paying and what the author is getting. 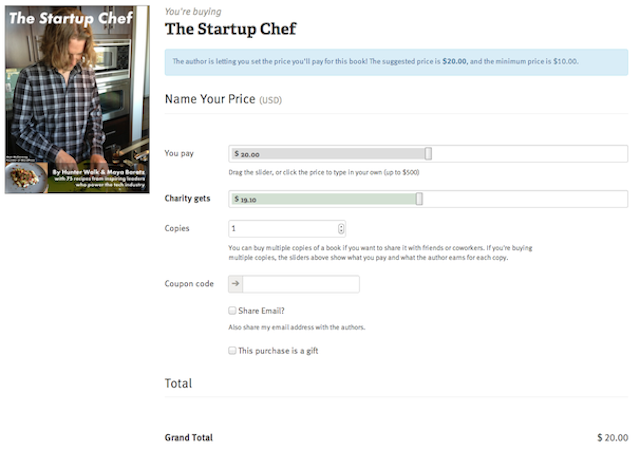 Now, since The Startup Chef cookbook is a charity project, we do not want any profits from it. This means we’re just subtracting the transactions costs (which go to PayPal, not us!) from each sale, and passing on everything else to the charities. That means the ‘royalty’ from each sale is 97.01% minus 30 cents (because the transaction fees are 2.99% of the price plus 30 cents). That means that if you pay $20.00 for The Startup Chef, the charities receive $19.10 (alternatively, if you pay $10.00, for example, the charities get $9.40). Since any donation you make will inevitably have some kind of transaction costs associated with it, this is pretty much like giving to the charities directly — only in this case you (or someone you’re giving the book to as a gift) get a bunch of cool recipes to try!